Have you ever experienced your coffee spills out and stain your carpet? Okay, this is probably really annoying by remembering that the coffee stain is not that easy to remove. It is by remembering that your coffee is in the form of liquid that can be easily absorbed. More than that, it has black color in which it will dye the carpet as well. If you lucky, your detergent may be able to clean it properly. Unfortunately, there is almost no real review about a detergent that can do that anyway. However, you must not be so confused about that. There are so many things around us that can be used to remove coffee stain on the carpet. Good news about coffee stain is that the structure is not rapid and stretched like honey or condensed milk. Theoretically, it is much easier to remove the stain. This ingredient must be simply found in your own kitchen. Indeed, white vinegar is not only good to make your dishes more delicious. More than that, it is really advantageous as well to remove many kinds of dirt and stain including coffee. The way to use it is really easy. First of all, just pour the vinegar on the warm water and then put the mix in a bottle with spray. 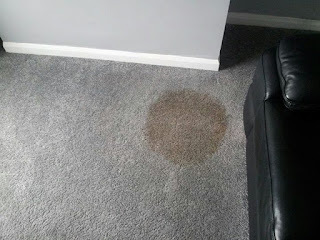 You can spray the part of carpet with coffees stain and then wait if for 10 to 15 minutes. You can brush the stain then with water and detergent until the stain is removed. Rinse it with water and then dry it for some other minutes. You can also directly brush the stain with the mix of warm water, detergent, and salt. Brush and rub it continuously until you find that the stain is disappeared. Actually, you can just remove it for minutes if the stain is not going deeper by only brushing it gently. However, if you think that the stain is bolder and the likes, it seems you need to brush it harder. You should not worry since it will not take too long time. It is due to the power of salt that has an ability to lift the dirt when it is with water. Meanwhile, the detergent here is used to make that power stronger. Besides, detergent is also functioned to make the carpet scented well. You actually can continue it by washing the carpet entirely. Do you know that baking soda is really effective as well to remove dirt and stain that come from coffee? The way to use it is very easy actually. First of all, just pour the baking soda on the part of your carpet with coffee stain. You can add some salt as well if you want to make the cleaning process more effective. Just let it dry for minutes by itself. After that, use wet sponge to rub the stain until it is removed. Another way is by using vacuum cleaner to take up the baking soda along with the stain.